NetControl.net Archive of :: Theater of Dionysus: Old Temple, Univ. of Sask. This image shows the foundations for the archaic age Old Temple of Dionysus (to the left) and, encroaching on them from the north, the west end of the fifth-century stoa. Old Temple of Dionysus: distyle in antis. Visible here are the euthynteria (the lower, bluish course of stone) and crepis (reddish Kara limestone) of the northwest end of the temple. (The return at the far end represents the back wall of the temple. There is also a return -- not visible in this photo -- representing the front wall of the cella.) The euthynteria strives for an ashlar appearance but consists of blocks of various sizes; the crepis is ashlar. There is a z-clamp on the crepis (not visible in this image); Dörpfeld saw a pi-clamp as well. The design, eastward orientation, and relation to the theater support the identification of this structure with the Old Temple to Dionysus described at Pausanias 1.20.3. (Cf., e.g., the similar temples in the theaters at Thorikos and Pergamon.) The clear attempt to preserve this building during later reconstructions of the theater complex (see below) demonstrates that it was a structure of some importance. 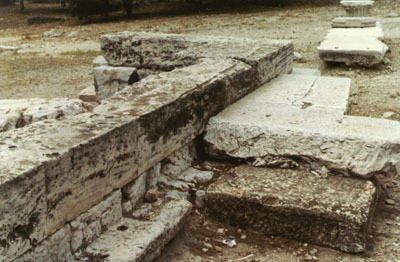 The combination of materials, masonry style, and clamps is consistent with a pre-Persian date. The presence of the Old Temple of Dionysus clearly presented challenges to the architects of the fifth-century theater complex. They constructed the new complex as far south as they possibly could, crowding the Old Temple but leaving it intact. The west end of the stoa must have had a blank wall in front rather than a colonnade: many have suggested that this area served as a combination green room and prop room. To Department of Classics Home Page. Page designed and maintained by John Porter.